An easement is the right to use another person's property for a specific purpose. It is a non-possessory interest in another person's land. There are many forms of easements, such as utility easements and right of ways. An easement or right-of-way in Connecticut may not be acquired from, in, upon, or over the land of another by the adverse use or enjoyment thereof unless the use has continued uninterrupted for fifteen years (47-37). The owner of land over which an easement or other right of way is claimed or used may give notice in writing to the person claiming or using the privilege, of his intention to dispute the right of way or other easement and to prevent the other party from acquiring the right. The notice, once served and recorded, is deemed an interruption of the use and will prevent the acquisition of a right thereto by the continuance of the use for any length of time thereafter (47-38). 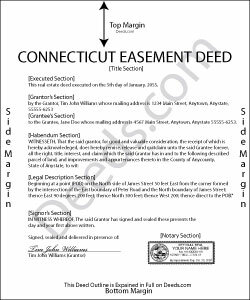 As an instrument that affects real property, an easement should be executed and acknowledged according to the rules of all other conveyances of real property in Connecticut. The grantor, or the person granting the easement, should sign the form and should have his or her signature acknowledged. If acknowledged in Connecticut, the acknowledgement must be made before a judge of a court of record, a clerk or commissioner of the Superior Court, a justice of the peace, a notary public, or a town clerk (47-5a). Out of state acknowledgements may be made by any of the officers listed in section 47-5a of the Connecticut Statutes. Land records are recorded in the offices of a city or town clerk in Connecticut. This state does not authorize county recording. No easement deed will be effective to hold any land against any other person but the grantor and his heirs unless it is recorded with the town or city clerk in the town or city where the land is located. The first recorded instrument will have priority over later recordings for the same real estate. Upon delivery to the grantee, an easement is effective as against the world, provided that it is recorded within a reasonable time period following the delivery (47-10).